A new research guide has been published on-line detailing an extensive catalogue of archival and reference sources for the exceptional Smock Alley theatre in Dublin’s historic Templebar. The guide comes as a new website has been launched specifically for Smock Alley. Prior to this, Smock Alley was placed only within the Gaiety School of Acting’s website. The Gaiety School, under the direction of Patrick Sutton and management of Niamh Byrne retains ownership and management of the spaces and buildings of Smock Alley. Opened in 1662 by the Scottish John Ogilvy, Smock Alley is one of the oldest theatres of it’s kind in Europe. It is celebrated as one of the great English language and post-Restoration theatres and flourished in the late 17th century. Within its management, designers and repertoire of actors it can boast Thomas Sheridan, Colley Cibber, Peg Woffington, Spranger Barry, Louis de Val, Charles Macklin, Richard Brinsley-Sheridan and many others. Smock Alley grew and developed its own very rich reputation as a place of immense spectacles, colourful performances and rich history. The building, more recently known as SS Michael and John’s church, has been completely redeveloped and a full archaeological examination has unearthed original structures, walls and vaults. Smock Alley has now been restored to much of its former glory and mystic but even more exciting developments lie ahead. It is envisioned to reinstate the main auditorium to fit the design of the original Smock Alley theatre while also maintaining the black-box studio space and utilize the amazing spaces of the Boys and Girls School adjacent. Smock Alley is running full time as one of the most exciting and challenging theatre spaces in Dublin. It is a cultural asset beyond measure in value and provides an experience for actor, director, designer and audience member that they will long struggle to forget. A recent production, Knives in Hens, by Landmark productions is one such production that will live long in the memory for those lucky enough to see this powerful and striking production. Smock Alley regularly stages works and participated in various festivals and city-wide cultural events. Scene from “Knives in Hens” by Landmark productions at Smock Alley. The guide to the archival sources for Smock Alley is an extremely beneficial tool to any researcher of Irish theatre or social and urban history of Dublin. The guide contains a detailed written history of Smock Alley, a listing and archive/library call numbers of plays and play texts that were produced by the numerous playwrights of Smock Alley, original posters from Smock Alley productions, newspapers which carried coverage and reports and general text and reference books on Smock Alley and on Irish and international theatre of the period. The guide can be downloaded in full from the Smock Alley website along with the full archaeological report and media and press coverage. The Gaiety School of Acting’s latest production was not on a usual Dublin stage but it did feature its largest ensemble cast. Dublin City Library and Archive on Pearse Street has acquired the archive of the Gaiety School of Acting, the national theatre school of Ireland. On 22nd February, the Dublin Room of Dublin City Library and Archives hosted an exhibition and evening of talks to mark this transfer of the Gaiety School’s records into the Irish National Theatre Archive. Some of Ireland’s most celebrated actors, directors and writers have graduated, taught at or are simply associated with the Gaiety School of Acting. Managers, staff and past students such as Joe Dowling, Pat Laffan, Mary Elizabeth Burke Kennedy, Don Wycherly, Karl Shiels, Eva Birthistle, Catherine Walker, Keith McErlean, Orlaith Rafter, Stuart Townsend, Flora Montgomery, Rory Nowlan and countless others have made the Gaiety School an established and essential part of the Irish theatre scene. Founded in 1986 by renowned actor, director and teacher, Joe Dowling, the Gaiety School evolved to meet head on a distinct lack of acting training in Ireland. Originally offering just a nine week evening course the Gaiety School has grown beyond all realms of belief. According to Joe Dowling, “When we started, there was a dearth of training [available in Ireland]. We wanted people in the profession to train the next generation of actors. I’m very proud we began it”. The collection contains all administrative, financial and Board of Directors records from the schools inception in 1986 up to early 1997. This ten year span was crucial in the development of the Gaiety School. It oversaw its growth from a single part-time course to offering full time actor training as well as part time acting courses. This period also records two changes of premises, from humble beginnings on Baggot Street to the move in 1995 to the Gaiety Schools current home on Sycamore Street in Templebar. The move to Templebar highlights the Gaiety School as another major cultural institution that relocated to Templebar during the redevelopment of the area in the early and mid 1990s. The correspondence, building plans and other records document the immense planning that went into such a move and are a vital resource for any social researcher or historian of urban redevelopment. The Templebar project grew from transformation of premises that were bought en masse by C.I.E. This urban redevelopment was happening in a period of Irish governance that saw three different Taoisigh from Charles Haughey, to Albert Reynolds to John Bruton, ranging from a Fianna Fail to Rainbow Coalition led Governments that took charge in pre-Celtic Tiger Ireland. The history of the Gaiety School, however, runs a lot deeper than 1986. A Gaiety Theatre School existed in the 1940s and was headed by the celebrated actress and director Ria Mooney. Very little documented evidence of this original Gaiety Theatre School exists. However, the archive of the Gaiety School of Acting proudly holds possibly the only documented account of this school. A prospectus of the school from the year 1944-45 in immaculate condition lists a detailed account of the acting training offered by the then Gaiety School and also a statement by the school principal Ria Mooney. Also present is a letter from Ria Mooney to a prospective student who was not successful in her desire to claim a place in the Gaiety Theatre School in 1945. The National Library of Ireland does hold a collection of Ria Mooney papers. These records do not contain any mention of her time at the Gaiety School and pertain only to her capacity as head of the Abbey theatre school, the position Mooney took up following her time at the Gaiety School. This fact acts only to emphasis the importance of the two items relating to the original Gaiety School. The Gaiety School of Acting archive also contains all records of graduate productions and showcases from 1986 to early 2010. There is an extensive collection of programmes, flyers, posters, press cuttings, reviews, scripts and ephemera from these productions which present a stirring and visual snapshot of the success and productivity of the school. Scrapbooks of marketing and press information highlight the challenge of promoting an actor training school and also document how Irish media and expectations of advertising also grew during the twenty four years covered by the Gaiety School archive. The archive also proudly boasts framed posters from productions directed by Gaiety School founder Joe Dowling at various Dublin theatres including The Gaiety Theatre, the Abbey Theatre and the Peacock Theatre. One of the most striking of these is a poster from the 1988 production of Translations by Brian Friel and directed by Joe Dowling. This production is often noted as being the definitive production of Translations and also starred the late, great actor Donal McCann. At Dublin City Archives the launch evening and exhibition was made all the more special by an exhibition featuring highlights from the Gaiety School past that was wonderfully orchestrated by Ellen Murphy, senior archivist at Dublin City Archives. Cllr Kevin Humphries, Deputy Mayor of Dublin addressed the assembled crowd of past and present Gaiety students, Gaiety staff and Board of Directors and those who had fond memories of the School. The event was completed by the presence and speech by school founder Joe Dowling who travelled from his current position as director the Guthrie Centre in Minneapolis, U.S.A. Dowling spoke of how the school came to be and of the effort required on so many fronts to see the school evolve into what it is today. 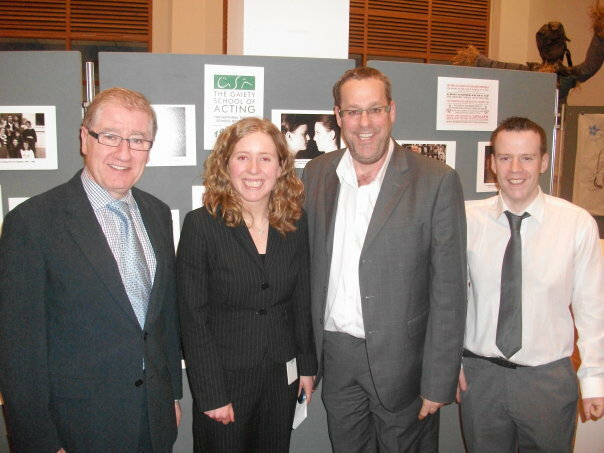 At the Gaiety School of Acting Archive launch: Joe Dowling, Gaiety School Founder, Ellen Murphy, Senior Archivist, Dublin City Archives, Patrick Sutton, Director Gaiety School of Archives and Barry Houlihan, Gaiety School Archivist. Current Gaiety School director Patrick Sutton spoke passionately about the challenges of running such a school in an economic climate that is often quick to forget the Arts when for so long Arts and culture was and is one of the main attractions of foreign tourism and investment to these shores. Sutton also addressed the students and described how to carve a career in the acting industry is not for the ill-committed and how it is not for the long established to call the shots in the industry but how it is ever more important for new creativity to rise and be noticed. A video montage, expertly assembled by past student Simon Stewart presented the skill and talent of past and current Gaiety School students. Rounding off the night, Patrick Sutton added: “We are delighted at becoming part of the documented theatre history of Dublin and hope that the archive will prove to be of interest to researchers in the coming years.” As many theatre companies are unfortunately falling victim to funding cuts and suffering as a result, the Gaiety School, which also manages the magnificent Smock Alley theatre is going from strength to strength and the commitment of its archive to a public institution is a great addition to the documented theatre heritage of Ireland.